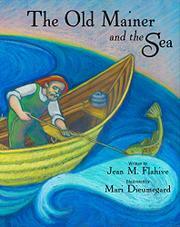 The tale of an old Mainer, his kind deed, and his just reward. Eben says goodbye to his wife, Della, on the shore, listening as she voices her concerns: he’s too old to make the 12-mile round trip to the market, and there will be fog later. But Eben sets out regardless, fishing as he rows his dory. But on this particular day, cod is not his only catch: three of his hooks pierce the beak of a harbor porpoise. The animal fights Eben, and the angry fisherman, frustrated because of the cuts to his hands from the line, threatens to sell him for bait. But seeing its eyes, Eben recognizes its fear and kindly sets it free. His good deed is later repaid when the porpoise helps guide his disabled and fog-shrouded boat safely into Portland Harbor. Dieumegard’s illustrations are composed of basic shapes and bright colors: trees are tall, stretched triangles, the water is marvelously swirled, and the fog’s made up of elongated blobs piled on top of one another. Eben and Della are both depicted as white. While this particular tale about Eben York is fictionalized, the real-life fisherman really did regularly row his dory 12 miles to sell his fish in Portland at the market in the late 1800s.